Nobody has more wisdom than a child's grandparents. They've been around the block more than a few times and whether you want to hear it or not, they will always tell you what they think is best. But when it comes to parenting, the younger generation should lend them an ear to hear what they have to say on the subject. After all, if they've made it this far they must be doing something right. 1. "Make time to be a couple after you become parents." Being a good father is certainly the most important aspect of a dad's life, but it should not be the only one. Being a good husband is important as well. 2. "Don't let the busyness of life keep you from having fun as a family." Making time to have fun is especially important because you don't want to regret not spending as much time with your kids as possible when they're young and still want you around. 3. "Maintain your authority over your children." You don't have to be running The Ayn Rand School for Children, but laying down the law occasionally is something that crosses generations. 4. "Donate old toys to needy children and be sensible about buying new ones." Older adults are generally quick to denigrate excessive doting on kids, but they're right about this one. 5. "When you divorce each other, don't divorce the children from us." 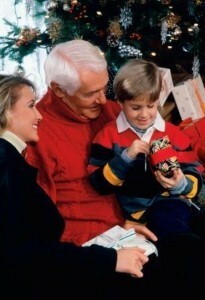 Just because you and your ex-wife do not speak does not mean your kids should not see their grandparents.